Persons with Scorpio Moons and Ascendants–and those with prominent Pluto aspects often show two versions of the physical traits of Scorpio–those of the Scorpion and the Eagle. 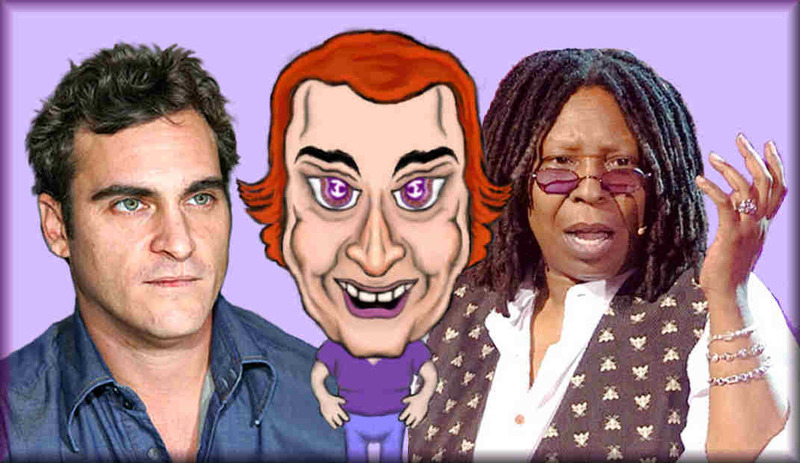 These two sides of Scorpio can be seen in the mysterious personalities and facial features of Scorpio Sun Signs Whoopi Goldberg and Joaquin Phoenix. Scorpions hide in the deep depths of fixed water. This gives them the intensely focused eyes and the facial features of Scorpio. With this intense demeanor, these Scorpios stand out in any crowd. Like the other fixed signs, Scorpios has a square forehead and jaw. What stands out is the prominent beak, the wide flat cheek-bones and the wide teeth, which appear to be capped with a thin upper lip. Also, their arms appear larger than most other signs, for these are the wings that take the Eagle off into flight. This facial collage of six celebrities displays the fixed water qualities and the common physical traits of Scorpio; It also shows how different astrological components alter the disposition and personality of these celebrities. Notably, Leonardo DeCaprio, Emma Stone and Anne Hathaway all have the calming breezes of Libra in their charts. Leonardo’s Moon and Ascendant are both in Libra. Emma also has Libra Rising and Anne has a Libra Moon. This presence of Cardinal Air spreads the eyes to the sides. This lightens the focused intensity in the eyes, as it gives the facial features of Scorpio a more pleasant appearance. When they are not playing heavy roles, the charm of Libra shines in these three stars. This was a key factor in their rise to stardom. Notably, Emma and Anne show the large pupils and piercing eyes of the Eagle. Scorpio eyes are usually larger than what we see in other signs, save for those in the Pisces fish. What was not mentioned previously is that Hathaway has a Sagittarius Ascendant. So, does Scarlett Johansson! You may notice that their facial features are similar. Both have the wide spread brows and cheekbones of Scorpio. But look at how their eyes sweep to the sides– to suggest that they belong to a horse. You will also see that one of their eyes rises noticeably above the other. You’ll also see skewed and angle features in the bone structure and reactions of Matthew McConaughey. His Virgo Ascendant and Gemini Moon are both mutable signs. These components makes him the most mercuric Scorpion in this group. With fixed Leo Rising and his fixed Sun, Martin Scorcese appears to be the most fixed of this group. Furthermore, the water element is strengthened by a grand trine between his Sun, Jupiter and his Pisces Moon. With all this fixity and water, we see why Martin (more than the others) shows the physical traits of Scorpio.